Since version 5.0, Sencha has advocated the use of Model-View-ViewModel (MVVM) architecture on its platform. It also maintains support for Model-View-Controller (MVC) architecture which was the primary architecture style supported up through version 4.x. 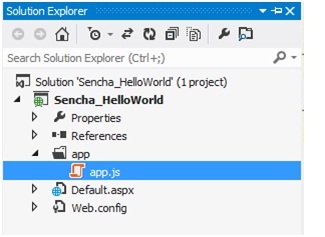 Additionally, Sencha has focused on outfitting ExtJS with mobile-centric and responsive web application capabilities. Its former Sencha Touch framework has been integrated with ExtJS since version 6.0 with efforts to combine the customer bases and consolidate redundancies in the new combined framework. After downloading the SDK ensure the archive is extracted before proceeding. Note: See the official Getting Started documentation for a comprehensive guide to ExtJS projects. We now have the tools necessary to create and deploy ExtJS applications, take note of the directory location where the SDK was extracted as this will be required in further examples. Let's start using ExtJS to build a simple web application. As shown in the screenshot, I have created an empty web application. To make it simple, you can use any web application project in the editor or IDE of your choice. If you have created an empty web application, then we need to include a web page that would be the starting page of our application. Sencha has partnered with CacheFly, a global content network, to provide free CDN hosting for the ExtJS framework. In this sample I have used Ext's CDN library, however we could use the same files (ext-all.js & ext-all.css) from our project directory instead or as backups in the event the CDN was unavailable. By referring to the app.js, it would be loaded into the browser and it would be the starting point for our application. Apart from these files, we have a placeholder where UI will be rendered. In this sample, we have a div with id “whitespace” that we will use later to render UI. ExtJS provides us with a way to manage the code in an MVC pattern. As shown in the screenshot, we have a container folder for our ExtJS application, in this case 'app'. This folder will contain all of our application code split into various folders, i.e., model, view, controller, store, etc. Currently, it has only the app.js file. App.js is the starting point of our application; for this sample I have just used minimum configuration required to launch the application. 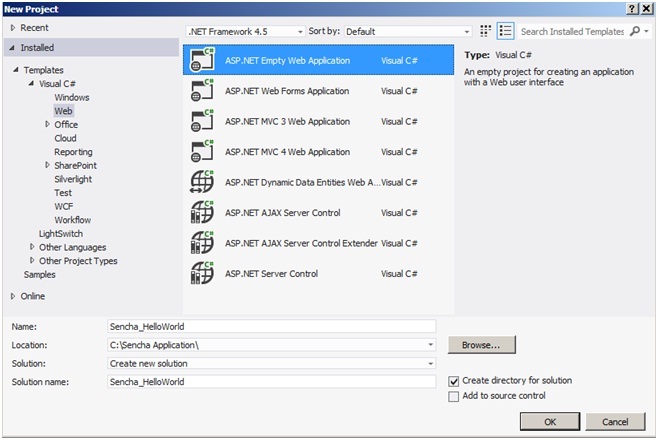 Ext.application represents an ExtJS application which does several things. It creates a global variable ‘SenchaApp’ provided in the name configuration and all of the application classes (models, views, controllers, stores) will reside in the single namespace. Launch is a function that is called automatically when all the application is ready (all the classes are loaded properly). In this sample, we are creating a Panel with some configuration and rendering it on the placeholder that we provided in the Default.aspx. When you run this web application with Default.aspx as a startup page, the following window will appear in the browser. 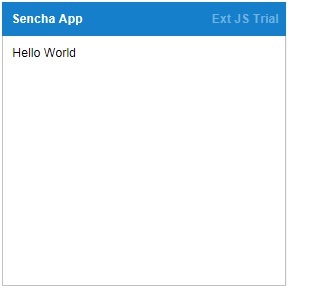 This example demonstrates creating a basic application in ExtJS using Sencha Cmd to bootstrap the process - this method will automatically generate some code and a skeleton structure for the project. Open a console window and change the working directory to an appropriate space in which to work. In the same window and directory run the following command to generate a new application. Note: The -sdk flag specifies the location of the directory extracted from the framework archive. In ExtJS 6+ Sencha have merged both the ExtJS and Touch frameworks into a single codebase, differentiated by the terms classic and modern respectively. For simplicity if you do not wish to target mobile devices, an additional flag may be specified in the command to reduce clutter in the workspace. By doing this, the project is compiled using the default build profile and a simple HTTP server is started which allows the viewing of the application locally through a web browser. By default on port 1841.